The term sugar can be confusing. Sugar is a type of carbohydrate, and in scientific terms is a sweet, short-chain carbohydrate. The 2 main groups of sugars are monosaccharides (glucose, fructose and galactose) and disaccharides (sucrose, lactose and maltose). Sucrose is what we know as table or granulated sugar. As you can see, words ending in ‘-ose’ are sugars which is handy if you read ingredient lists on packets of food and want to know if sugar has been added. When we eat sugar (and carbohydrates in general), they are broken down by our body into glucose which fuels our brain and muscles. If we eat more carbohydrate than we need, it is converted to fat. Eating a good diet is a delicate balance of eating the right proportions of carbohydrate, fat and protein in the right amounts for our individualised lifestyles. What works for one, might not work for someone else. Sugars are found naturally in foods such as fruit (glucose, fructose) and milk/milk products (lactose). Along with the sugar, these foods can also contain fibre, vitamins, minerals and photochemicals so the whole package is pretty appealing. Compare this to fizzy drinks or lollies, which are largely made up of sugar and little else in terms of nutrients. These foods are often labelled as “empty calories”. Sugar is also often added to packaged foods to bulk them up for less cost, items such as low fat ice cream, yoghurt, peanut butter, tomato sauce and dressings for example. We can be unaware of how much sugar we are eating when we regularly eat these, as the foods don’t always taste sweet. You can see not all sugars or foods containing sugar are created equal, and wholefoods have the definite edge when it comes to health because as well as some sugars you also get a whole range of other important components of a healthy diet. The take home message. When it comes to sugar, aim to have most of your sugar intake from whole foods such as fruit, vegetables, legumes and milk products. If you eat a lot of high-sugar processed foods or add a lot of sugar to your food and drinks, aim to reduce this as it won’t be doing your health any favours. 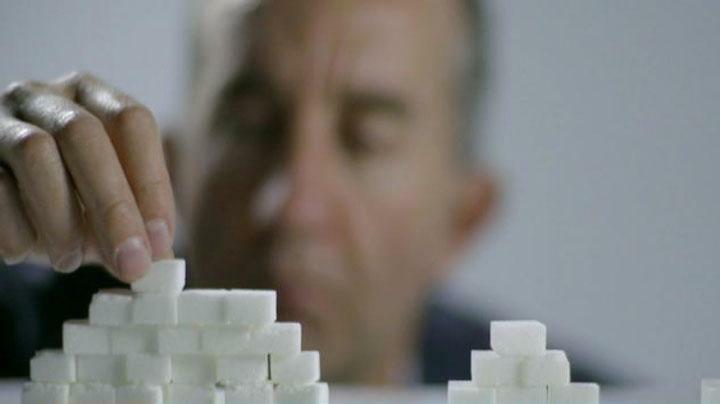 A little added sugar is fine as part of a balanced diet though, moderation is the key. Sarah Percy – Registered Dietitian.